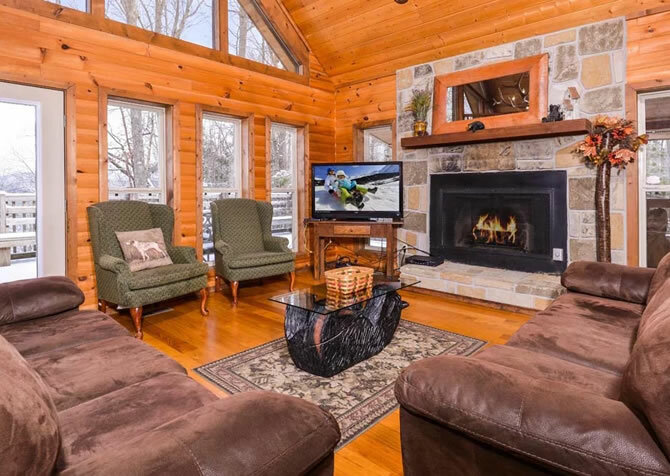 Book a stay with the entire family—4-legged members and all—at Keaton’s Kabin, a classy, pet-friendly Smoky Mountain cabin with elegant furnishings, wooded views, and up-to-date amenities. Along with 5 bedrooms and 5 bathrooms, guests of Keaton’s Kabin will enjoy a modern kitchen (with 2 of almost everything), large living spaces, and a fully equipped game room that rivals any arcade on the Pigeon Forge Parkway. To add to your relaxation and fun, this pet-friendly cabin also offers a private theater and an indoor private pool! Round up 16 family members for a much-needed reunion, or plan a friends, co-workers, or college buddies getaway at Keaton’s Kabin, where you’ll find plenty to do—no matter your mix of ages. As part of the Sherwood Forest, Keaton’s Kabin also conveniently offers access to a community pool and outdoor hot tub and a short, less-than-4-mile drive to downtown Pigeon Forge. So whether you decide to stay at the cabin or ride the trolley down the Parkway, you’ll find tons of ways to have fun at this more-than-4,000-square-foot modern mountain retreat! When you’ve made it back from fun, family-friendly attractions like The Comedy Barn in Pigeon Forge, you’ll appreciate the chance to relax inside Keaton Kabin’s wide open living room. With multiple seating options—including 2 full-size leather couches, 2 matching chairs, and 2 padded rockers—you should easily fit the majority of your group in this large space. Sit together and talk in front of the electric fireplace, exchange gifts during the holidays, or watch the big game on the huge flatscreen TV. And remember, your furry best friend can rest by your feet the whole time at Keaton’s Kabin! This pet-friendly cabin makes it convenient to get away and enjoy each other’s company without worrying about kennel fees or your pups missing out on the fun of hiking in the Smokies. So keep everyone together and get ready for a great time at Keaton’s Kabin! Fashionable and functional—that’s a pretty accurate description of this cabin’s huge, L-shaped kitchen. With honey-colored cabinets, stainless steel appliances, beautiful granite countertops, and recessed lighting, you’ll love this modern kitchen that looks straight off the pages of a magazine! And don’t worry—your eyes aren’t playing tricks. There really are 2 of nearly everything, and with a large group, you definitely won’t regret having 2 refrigerators, 2 ovens, 2 electric stoves, 2 microwaves, and 2 coffeemakers. Keaton’s Kabin even comes with a crockpot for easy, one-step recipes that you can leave alone throughout the day and enjoy together around the table at night. 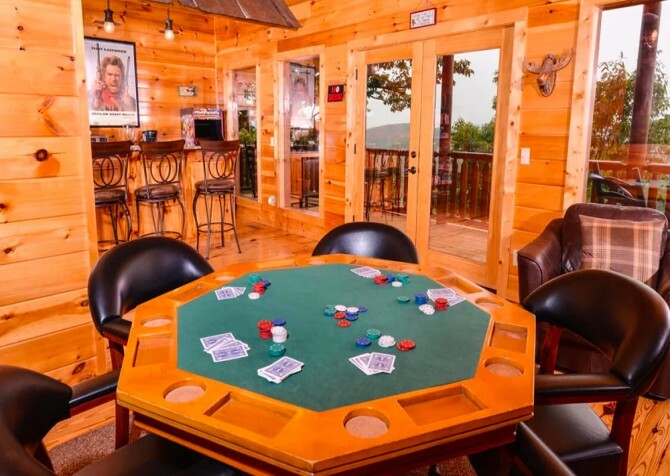 Of course, you can always spread into the living room or eat at the breakfast bar or take your dinner to the game room for an eat-while-you-play evening inside the cabin. But for quality family time, we always recommend squeezing around the dinner table for a delicious meal and pleasant conversation! 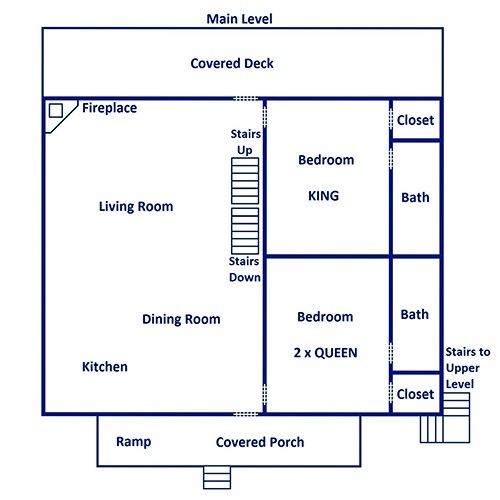 While you have a great space in the dining room to eat, you may find yourself heading up with your plate to the loft. 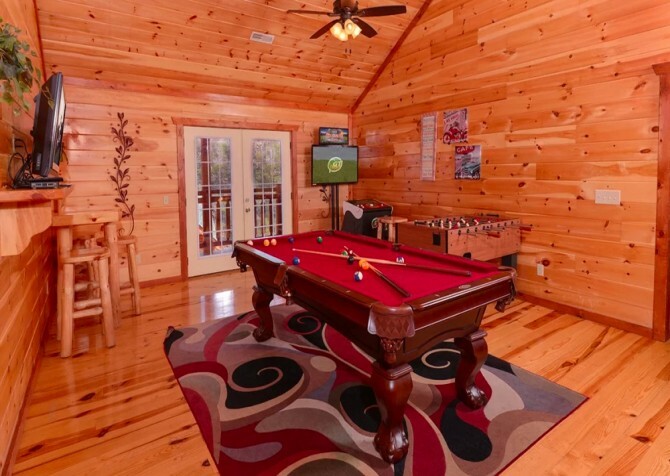 That’s because Keaton’s Kabin has one of the best game rooms of any cabin in Pigeon Forge! Not only does this large, amusement-filled space come with a full-size pool table, but also modern arcade games (including a driving game), an electronic poker table, and more. So if you can’t find something fun to do inside Keaton’s Kabin, you just haven’t found the loft yet! Feel free to pack board games and cards in your suitcase, but you probably won’t need them when you book your stay at Keaton’s Kabin. Already Keaton’s Kabin offers a huge flatscreen in the living room, and each bedroom comes equipped with its own TV. But none of that was meant to replace your very own private theater! With tiered seating and a fully enclosed space, you’ll really feel like you’re at the movies when you turn out the lights. But forget about those theater-style, fold-down chairs. Keaton’s Kabin provides 3 rows of all-black leather recliners! So plan to watch your favorite DVDs or Blu-ray discs on the big screen in the epitome of comfort and style at Keaton’s Kabin. You thought we were done? Far from it! 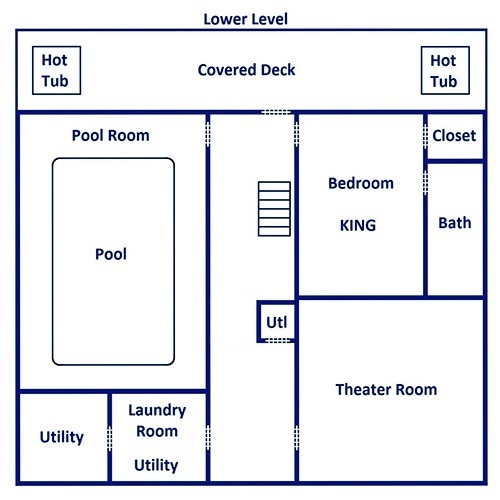 Keaton’s Kabin still has so much more to offer, including a fully enclosed private pool! Even our wintertime guests can enjoy a refreshing dip in this large pool (kept at 85 degrees) surrounded by windows and beautiful, natural wood walls. Enjoy views of the Smoky Mountain trees while you swim a few laps or splash with the kids. This pool provides the privacy you crave after spending time at the crowded attractions downtown. And as part of the Sherwood Forest, Keaton’s Kabin also provides access to a community outdoor pool and hot tub. So if you want to get outside and catch some rays, head to the large pool that’s just down the road! Keaton’s Kabin features 5 bedrooms, 5 bathrooms, and comfortable sleeping space for up to 16 guests. While each bedroom has its own unique appeal, these are some of the features you’ll find in each: elegant wood furniture, comfortable seating, reading lamps and nightstands, and huge flatscreen TVs. You’ll even find TVs in the bathroom at Keaton’s Kabin! Something unique to this cabin is having 2 beds in 3 of its largest bedrooms; this means you can add many more guests to your vacation list without sacrificing comfort. Total, you’ll find 6 king-size beds and 2 queen-size beds inside Keaton’s Kabin. What you’ll love about the outdoor spaces at Keaton’s Kabin is the amount of privacy and beauty supplied by the Smoky Mountain trees. With tree-lined views, you will be able to enjoy the tucked-away feeling of a cabin in the woods without the isolation that usually entails. Downtown Pigeon Forge is actually less than 4 miles from Keaton’s Kabin! So make the most of your semi-private retreat at this pet-friendly lodge. Sit at the patio table with your pet in your lap or sip iced tea with the gang while you each enjoy your own rocker. 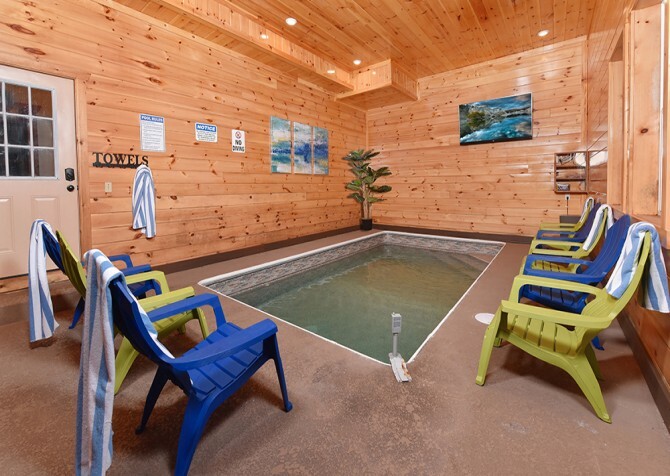 At night, soothe sore muscles with a soak in 1 of 2 outdoor hot tubs provided by this cabin. With 3 decks and all these outdoor amenities, you’re sure to love spending time in the fresh mountain air at Keaton’s Kabin! As part of the Sherwood Forest, Keaton’s Kabin access to a community outdoor pool and hot tub. This is on top of the private indoor pool and outdoor hot tubs already supplied by the cabin! 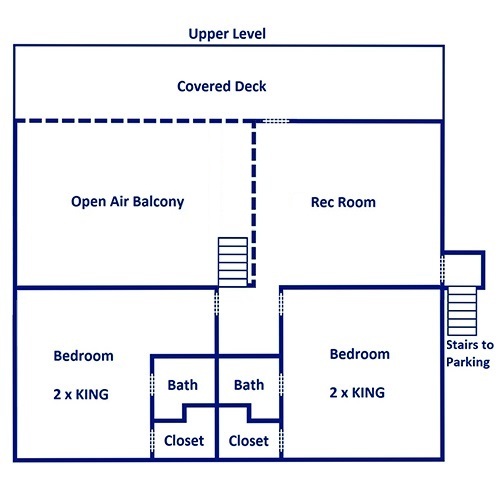 So don’t miss out on anything that Keaton’s Kabin has to offer during your stay, including these additional amenities: a flat, paved driveway with 6 parking spaces, a charcoal (picnic area style) grill, a washer and dryer, and high speed wireless internet. If you love the arcade games inside Keaton’s Kabin and want more, head to the Big Top Arcade—a circus-themed indoor arcade in Pigeon Forge. Right next to the Big Top Arcade, you’ll find this one-stop family-friendly attraction with a go-kart track, kiddie rides, thrilling adult rides, and more. Care to play mini golf while you’re in town? Head to Fantasy Golf for two 18-hole courses straight out of a fantasy.